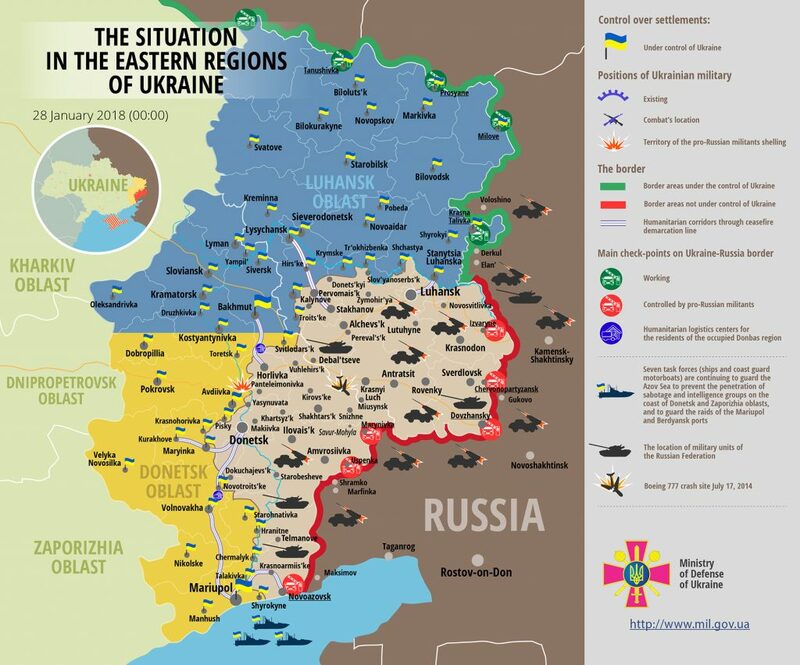 Russia-backed militants violated the ceasefire one time in eastern Ukraine yesterday. The incident took place in Donetsk sector. “Starting from 13.30, militants’ sniper, based in Panteleimonivka, controlled by Russian proxies, has been firing on our positions in Verkhnotoretske. The attack continued for 30 minutes,” reported Ukrainian Ministry of Defense spokesman on ATO Colonel Dmytro Hutsulyak at a press briefing at Ukraine Crisis Media Center. Unfortunately, one Ukrainian serviceman was killed during this attack. Report on the military developments as of January 27 is available here. Interactive data on the shelling: chronology shelling chart and the interactive map.